As I said the other day, we attended lectures almost almost all day on Saturday. I am not sure why I signed up for such a marathon, but with one exception they were all very good. My new hero. Have I said I want to be her new BFF? Actually I want to be her: tall, gorgeous, funny, kind and makes 14-20 quilt tops a week. VFW’s lecture was called Creativity & Play/Process. This was a new lecture for her, so we were getting the unpracticed version. It wasn’t that she didn’t do a good job; she did. She just wasn’t as familiar with the flow of the words. Any of you who speak frequently in front of a crowd know how it is to work out the kinks on a new lecture. To her, process and play are the same. Process should not stifle your creativity or imagination. We are often trained out of using our intuition, which means that we don’t know how to use intuition in our work. She encouraged us to think about and document how we work, think about the colors we always buy then rip the process apart and see what comes from changing it up. 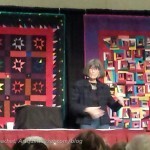 She encouraged the audience to put a story into the quilt in order to make a connection with the quilt. Having an idea in our heads doesn’t mean that the quilt will end up that way, which means we have to be open minded in our quiltmaking. You can always make them into something else by cutting them up or appliqueing on top or….? Making creative decisions means you are an artist (NO arguing with me or her about that! ), which, further, means we are all artists. One of the things she asked after describing these creative types was which one we thought we were. As she described the types I kept thinking I was this one or that one, then I realized I had elements of all of them in me. I panicked a little until she said she had elements of all in her, too. If you aren’t having fun, find a new passion. Life is too short and we are all just doing our best. Making mistakes is a learning experience. We are all perfect in our imperfections. Not all great ideas are great, but why not explore them? Quilts don’t always happen on your timetable. I liked her advice and thinking about what she was saying. I realized that I did cut up a quilt once: the Renewed Jelly Roll Race. It was horrible and now it is actually a quilt I am not embarrassed to show people. If you haven’t seen her speak, get there NOW! If you haven’t taken a workshop from her, do whatever it takes to get into her class. She is awesome. You might remember that I took a 2 day workshop from her around 2003. I made the Women’s Work quilt, which is still part of a series that I haven’t worked on any further. I will do it; I just haven’t yet. Gwen Marston is a funny, confident speaker. She engages with the audience very well. I felt mesmerized and riveted by her talk. She started making quilts when she saw a quilt show at a Mennonite church in Oregon. After that she went to the quilt group every week the whole year her family spent in Oregon. She only stopped going after er husband;s sabbatical was over and they returned to Michigan. She left with the knowledge to make quilts. After that she got together with Mary Schafer. They both liked the irregularity of antique quilts and thought newer quilts seemed too coordinated and matchy-matchy. Antique quilts seemed spontaneous. She decided to model her quilts after vintage quilts. Gwen wants spontaneity in her quilts. She embraced possibilities. She thinks good technique is important, but that an overabundance of concern about precision stifles creativity. She wants her quilts to be square with no ruffly edges. When she makes a new quilt, she thinks about it as making up a new recipe – she gives herself parameters. She works a lot in solids, but also works with prints. She kind of rocked my world about bindings. First, Gwen talked about Amish bindings. Amish bindings are on the straight of the grain. They put the sides on first and then the top and bottom. They do not miter the corners. I have never heard of this and have not checked it out. I also can’t imagine how they would finish the ends of the top and bottoms. Something to contemplate. If you try stuff, some of it will not work. That is part of the game/process. Take a chance! Think about the practical or smart way to do something not the ‘right’ way. 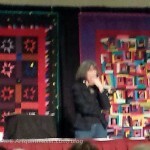 I think I have a couple of more posts in me about random QuiltCon things, so stay tuned for those.